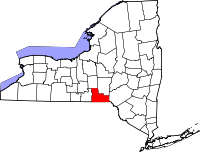 Broome County, which has over 200,000 residents as of 2010, is part of the Binghamton Metropolitan Area. The town of Binghamton, which has about one quarter of Broome's population, is the county seat and is where all the local county government agencies are located, most of which are housed within the government complex downtown. The County Clerk is on the 3rd floor of the Edwin L. Crawford County Office Building. The office has records dated before 1964 on file at its physical location, and records dating after that are provided online via the free Public Access Retrieval Information System. Among the records the Clerk has on file include birth, death, probate, property, and other types of records, and many of them date as far back as 1881 to the present. The Records Management Division, which operates under the jurisdiction of the County Clerk, serves as the local storage point for archived records.